With the arrival of Christmas , I decided to try my hand in the typical dessert of Milan, the city that for 10 years I am staying with affection : I’m obviously speaking of the panettone. Defying my laziness and the claim of my blog , ” recipes fast and easy to implement ,” I took advantage of a Sunday in cold and my seasonal illness and I prepared the panettone at home ( following the procedure buy Sonia Peronaci ) , but instead to stuff it with candied fruit and raisins ( my husband hates them ) , I used the exquisite chocolate chips. I must say that the preparation is long and that , if it were not for the Thermomix , was also a bit ‘ complicated : with the Thermomix , instead , you just have the patience to wait for completing the various stages of fermentation. 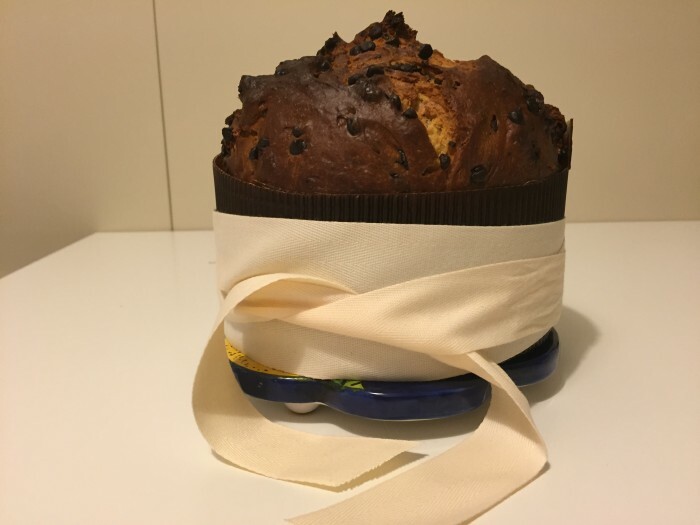 The result , after so long wait , it was nothing short of outstanding : good , soft and fragrant more than industrial panettone and , in addition, the house was filled with a sweet scent of sweet that it seemed to be in a pastry . If you also want to experience the thrill of preparing homemade panettone , follow me into the kitchen and let’s prepare it together ! 50 ml of milk . 1 vanilla bean (the seeds only). Let’s beginning to prepare our panettone! FIRST DOUGH : Heat the milk and put inside the yeast and sugar or honey. Add the flours and knead until a smooth ball . If you have the Thermomix , heat the milk , yeast and sugar to 50 degrees , for two minutes at speeds spoon , then add the two flours and knead for 3 minutes in speed Dough . Put the dough in a bowl ( if you have the Thermomix , leave it in the bowl closed ) and let it rise for at least an hour ( it should double in volume ) . SECOND DOUGH : Add to first leavened dough the egg , the yeast , sugar and butter and knead until dough is smooth and slightly sticky ( if you have the Thermomix , add the ingredients and let go Dough mode for 3 minutes ) . This second dough should double in volume too : so, cover with plastic wrap ( if you have the Thermomix , leaving it in the bowl closed ) and let rise for at least two hours ( even better in half an hour more ) . THIRD DOUGH : Add to leavened dough the egg and the 2 egg yolks , the flours , sugar, pinch of salt , butter, grated lemon peel , the seeds of the vanilla ( engrave the bean for the long and drawn out the seeds with a knife , using the blade from the non-cutting side ) and mix thoroughly ; only at the end , add to the dough even chocolate chips. If you have the Thermomix , add to the dough all ingredients except the chocolate chips and process for 3 minutes in speed Dough ; add , finally , the chocolate chips to the dough and mix for a minute , always at speed Dough . Also this dough should rise : whatever method you have followed , put it in a bowl covered by the plastic wrap and leave in the oven off but with the light on for three hours (it should double in volume ) . At this point , if you have the proper pan , use that one after having buttered and lined with parchment paper ; otherwise do as I did and use a paper mold of 750 grams . Give then a spherical shape to your leavened dough and transfer it to the pan or paper mold and let it rise again ( always covered with plastic wrap , in the oven off but with the light on ) until it reaches the edge of the mold. Well … we’re almost at the end , when the dough is raised to the edge of the mold , remove from the oven, turn the oven on to 200 degrees in static mode, and let aerate the dough for about fifteen minutes , to allow the formation a cuticle on the surface : after this time , with a smooth blade knife make a cross on the surface and the center put a cube of butter . When the oven will be arrived at room temperature , put a glass pan with water in the bottom of the oven and bake your cake at the lowest level : cook for the first 15 minutes at 200 degrees, then for the next 15 minutes at 190 degrees and , finally, for the last half hour at 180 degrees : spent this time , your panettone is ready to be baked off and tasted ! If you like my recipes, I’ll wait for you on Facebook, Instagram, Twitter and Pinterest!